Remember my idea ages ago with Foodie Friday? Well, I'm trying again, but this time, I'm including stuff made by Husband. Why? Let's be honest, in this place, he does the cooking. I do the baking...usually. He's a good cook and we have a lot of recipes we've adapted for gluten free cooking. 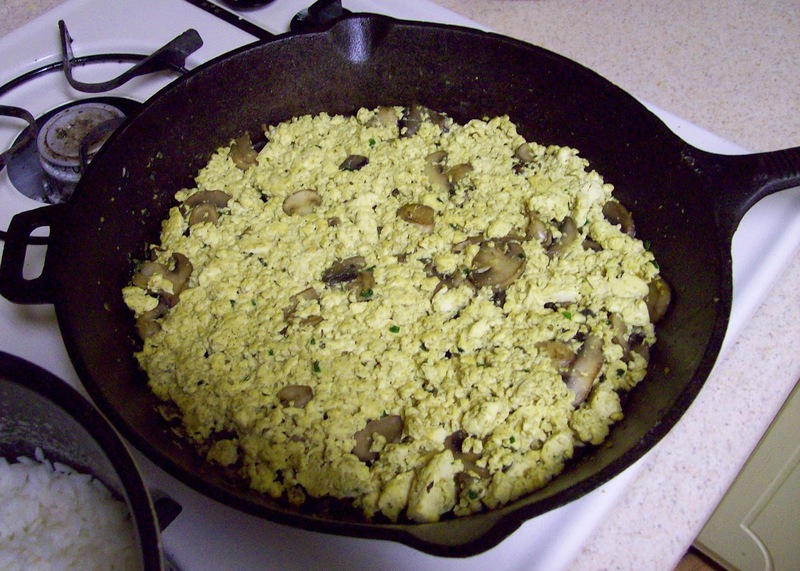 Mushroom Scrambled Tofu (or as we call it: Tofu Scramble) which is in The Vegetarian 5-Ingredient Gourmet by Nava Atlas (page 133). This book was an impulse buy from one of our favorite used book stores. It only cost us $5 and was like new! Now, since I don't cook this, I really can't comment on it. The only thing I can say is that I'm so glad he uses an iron skillet. I personally think food tastes better when cooked in iron, but that's me. I did ask him though what he thought about cooking this recipe: "SOOOOOO easy. 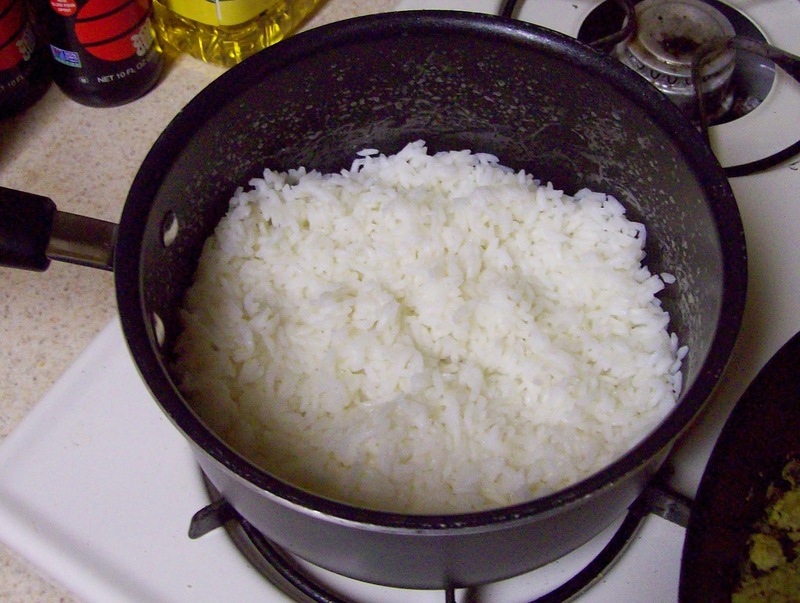 The only thing that would make it easier is if you used instant rice." He doesn't. He's been experimenting with cooking real rice. Anyway, I know this is a recipe he likes to make up because every week he asks "Tofu Scramble?" This is his go-to dish once a week for the simple fact it is easy. It also provides us with 4 meals: 2 for that night and 2 for leftovers. When he first made this, I thought this looked like scrambled eggs. I thought it was going to be bland, but surprisingly it isn't and it goes great with rice (actually, there's curry powder in this). In fact, this is one of those dishes I look forward to as left overs. Unlike some other leftovers, this one keeps flavor and is fantastic mixed up in rice. I tend to have it as my evening shift dinner and I think it is a good match. It is light and delicious. First, the recipe calls for margarine. Um. No. We do not do margarine in this place. We use butter. Butter is good. Next is the mushrooms. Whatever is on sale at the store is what we get, but no matter what, they work. I think at some point, he wants to experiment with rice and move us from white rice to something else. Fourth, we've used both soft and firm tofu and it seems to turn out the same both ways, but the softer tofu is definitely better. If you can check out this book, do. We haven't fully explored this book yet, but just from this recipe, I think that there is probably more in here we'll love. We just haven't tried many yet. This recipe is (for the moment) in our rotation of recipes.